19cm x 16.5cm. These have the lugs on the top for the shelf. 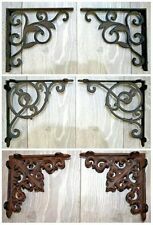 Pair of Mini Cast Iron Decorative Victorian Gothic Shelf Brackets. Can be used either way up for a 4" (10cm) or a 5" (12.5cm) support. Strong and elegant shelf supports. Perfect for elegant book shelves. 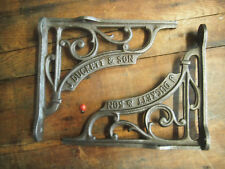 Pair of Cast Iron Decorative Victorian Gothic Shelf Brackets. 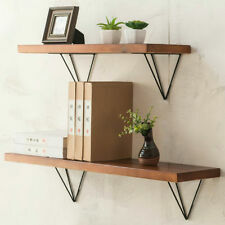 A very strong and elegant shelf support with a Gothic design. Perfect for elegant book shelves or to support a cistern. Can be used either way round to give a 20cm or 18cm support. Small Wall Hanging Shelf Display Rack. Another place where this wall rack will look stunning is. Great for the kitchen to keep small jars and spices. Pair LONDON SW1 Vintage style cast iron shelf bracket Sink Toilet Cistern 6"
These have the lugs on the top for a more stable shelf. I BUILT A CEILING HEIGHT ROWS OF BOOK SHELVING AND THEY LOOK VERY AUTHENTIC. 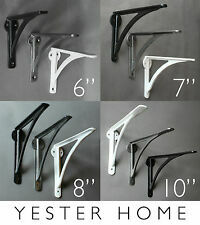 Designed to be wall mounted each bracket features two holes for wall mounting and two holes for mounting to the shelf. Screws and fixings are not included. Cast iron with an aged appearance. Each bracket features four mounting holes. Pair COVENT GARDEN Vintage style cast iron shelf bracket Sink Toilet Cistern 6"
Antique Cast Iron Wall / Shelf Bracket Gallows Design x1. Traditional – approx. 210mm height by 210mm projection and52mm width 450 grams. No artificial coatings are used giving them a living finish and allowing them to age naturally. Pair Shelf / Wall Bracket Gallows c/w Lugs Antique Iron 8" (exact size is 210 x 215mm). so people did not like the grind marks so we have aged them slightly. designed for that industrial looking shelf bracket. Pair SINGER CORP Vintage style cast iron shelf bracket Sink Toilet Cistern 6"
These have the lugs on the top for shelf's. 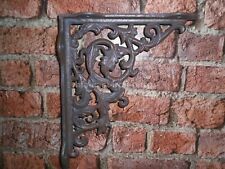 Pair of Very Large Arts and Crafts Ivy Design Shelf Brackets - 12" (30cm). A seriously large bracket with a beautiful decorative design. 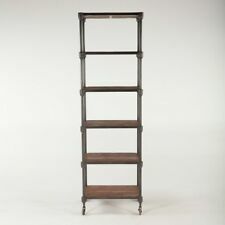 Perfect for elegant book shelves or to support a large sink or cistern. Pair of Cast Iron Railway Style Column Brackets. A beautiful shelf bracket with an ornate, classical design. Price is for two brackets. Looking for an odd number?. Made of cast iron with a protective lacquer finish. Pair WATERLOO Vintage style cast iron shelf bracket Sink Toilet Cistern 6"
One Cast Iron Decorative Railway Shelf Brackets with GNER Cast. Weight: 400g (approx per bracket). 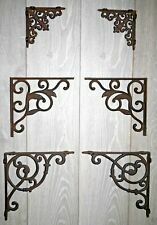 These brackets have a natural iron finish with a lacquer protection. Pre-drilled with three holes on each side. 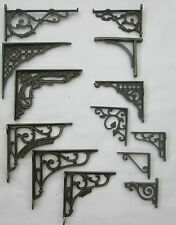 Pair of Cast Iron Decorative Railway Shelf Brackets with GNER cast. A strong and elegant shelf support with a simple scrollwork design. Victorian industrial design. Perfect for a railway enthusiast or for elegant book shelves. 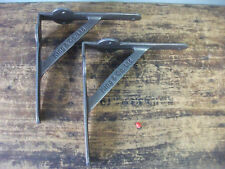 · pair Shelf / Wall Bracket Gallows c/w Lugs Antique Iron 8" x 4" (exact size is 200 x 103mm). · designed for that industrial looking shelf bracket. · ideal for that rust look or just seal them with furniture wax, paint them.